The post title does not refer to cracked or skipping vinyl discs, but to my fundraising ride this past weekend doing better than previous rides in 2 respects. 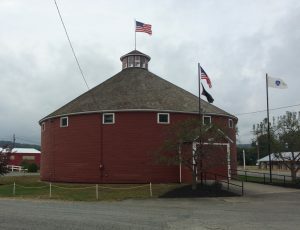 First off, the fundraising: people donated more to this ride than in any of the other five times I’ve asked for such donations (2007 and 2009 for the National MS Society, and 2011-2013 for the Food Bank). All the donations from others came to $1450. With the $1000 I contributed myself, that’s $2450 in total. An e-mail that was sent out today says the whole event brought in over $114,000 in contributions. It feels great that the organization is getting so much! Thank you again to everyone who donated. 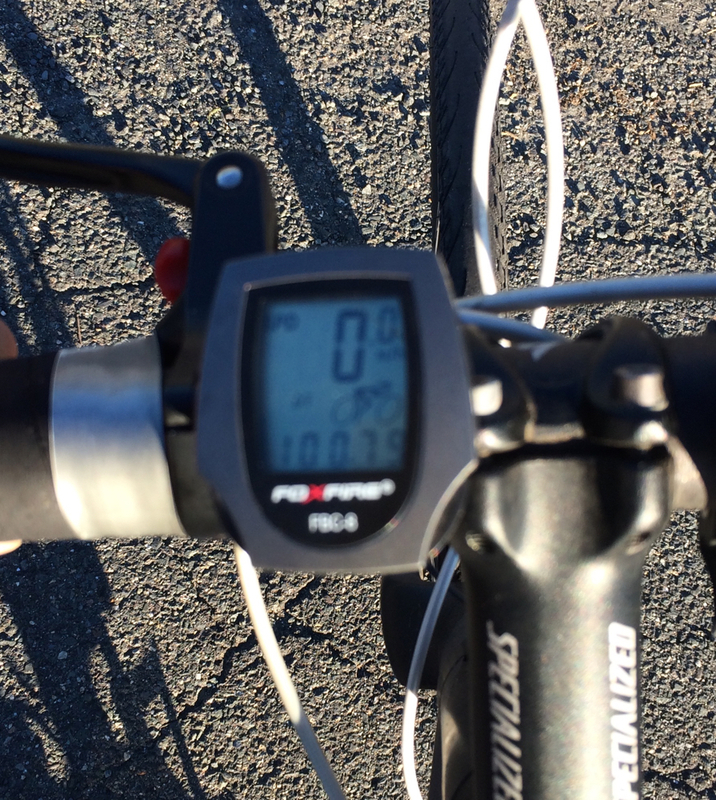 The other record, as referenced in my live posts from Sunday, is that I rode 100 miles in less time than ever before. 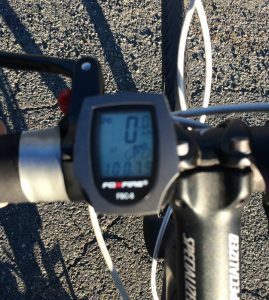 My previous best time for this distance was 10 hours and 30 minutes (which was, interestingly, how long it took me the first time I ever did a century ride, in 2011). This ride started out chilly, as the temperature was in the 40s when I showed up at the start. 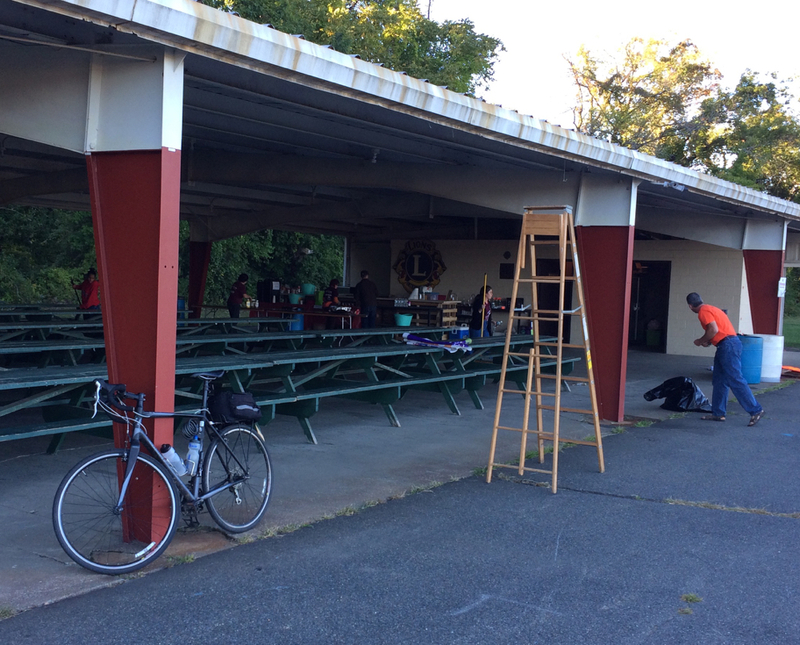 It started and ended at the Lions’ Club Pavilion in Hatfield, which is in the town center. 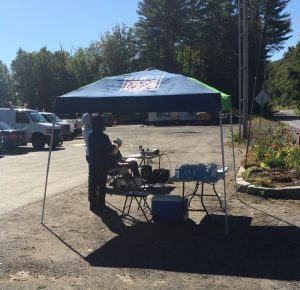 I had driven there with the bike, arriving about 6:30am, and then got checked in and had some of the provided breakfast (a bagel with cream cheese and a sweet roll). Some signage, etc. 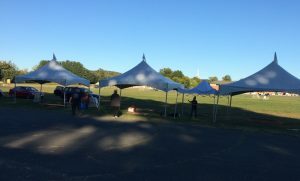 was still being set up as I prepared to get going. The official start time for the 100-mile route was 7:00, and while riders on that route could start whenever they were ready, I ended up getting going right at 7. The sun had just come up, but there was fog to be seen in some places. 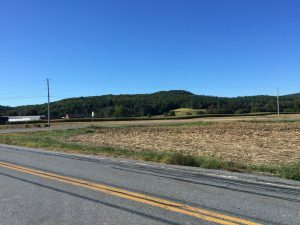 The route went north through Whately, where I saw a rabbit and some chipmunks on the side of the road who seemed surprised that humans were passing by so early. 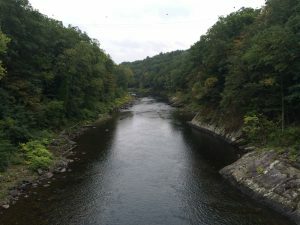 I then passed into Deerfield, continuing north along the Connecticut River. Just after entering that town I passed into pretty heavy fog. Fortunately traffic was very light. 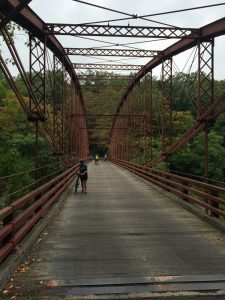 In the north part of Deerfield, the route went onto a bike trail, crossing the river into Montague. We followed the trail all the way into the Turner’s Falls section of town, and then exited up onto the road just in time to cross the CT River again into the town of Gill. I stopped to use a bathroom just before crossing the river here. Once in Gill, the route climbed a sizeable hill, at the same time that it went onto a road I’d never been on (called, appropriately, Mountain Road). This climb was not too bad – I was able to make it to the top without stopping, and then the downhill portion was mostly nice, except that it had a really tight S-curve on the steepest part. I had to really lay on the brakes and creep around the curves, for fear of losing control otherwise. I did stop briefly before reaching the bottom, just to get rid of my momentum and proceed slowly until the road became fairly straight. Once that hill came to an end, I turned back onto the main road in Gill (named Main Road, in fact) and passed through the center of town, then north past the Northfield-Mt. Hermon School, an old private boarding school up there in the countryside. The route took a couple of turns before continuing north, and seemed to go through small pieces of various towns. In order, I traveled in Gill, Northfield, Gill, Bernardston, Gill, and Northfield. 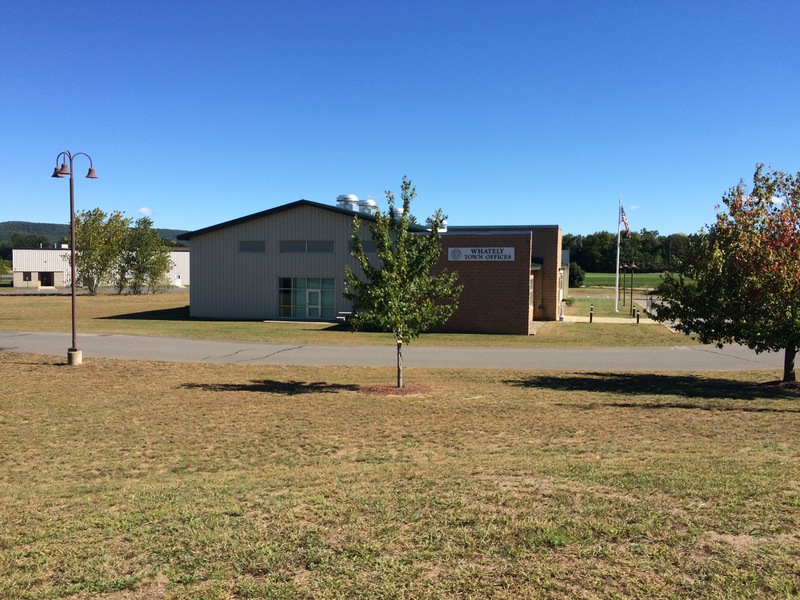 I was then heading north in Northfield (on route 142) for a little while, until I reached the Vermont state line. 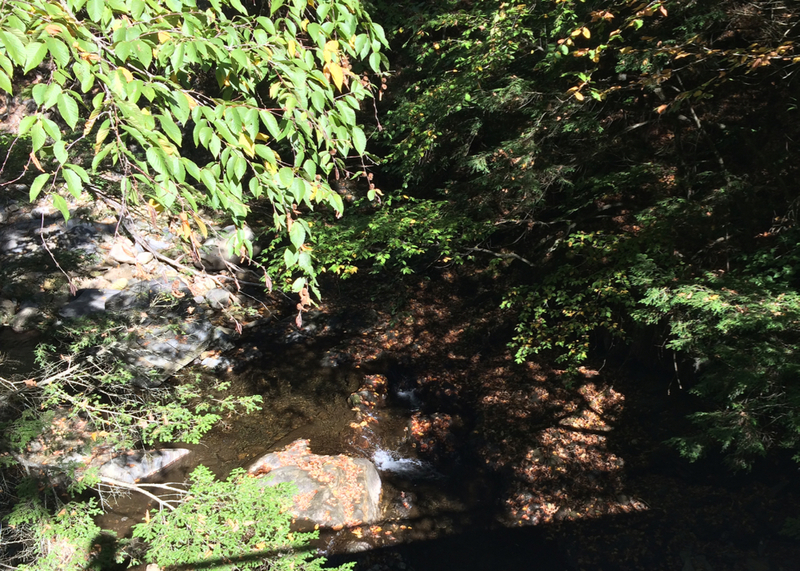 Eventually, just before the route turned west, I came upon the first water stop of the ride. 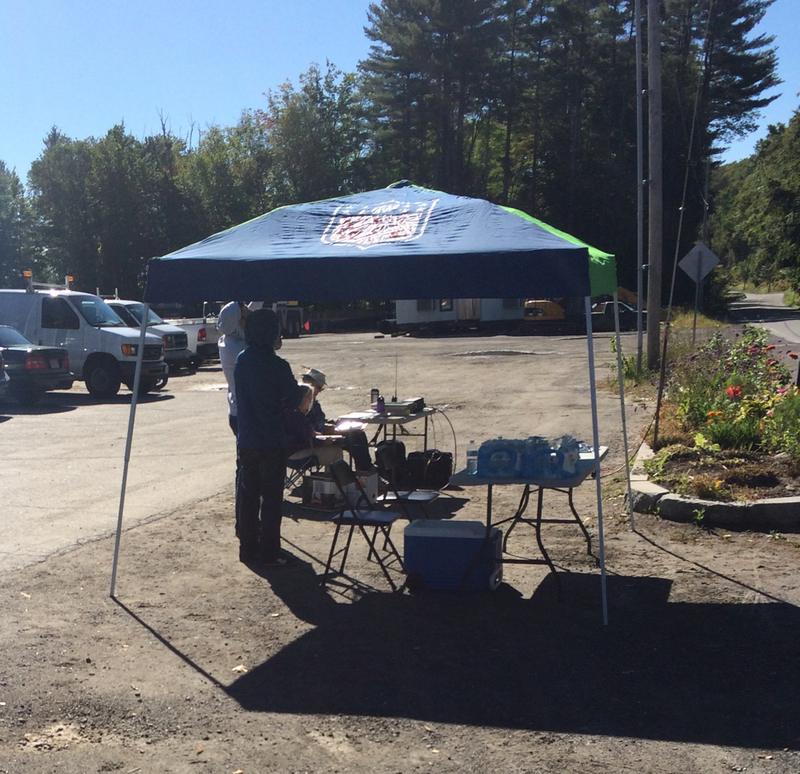 It was operated by volunteers from a local grocery store, and they had bottles of water and granola bars on offer. On reaching this stop, I’d gone 39 miles, and it was just about 10:30am. At a few points during the morning, I’d been passed by other cyclists. A group of 3 of them went by me just before this stop, and they left the stop pretty quickly. At that point, I think I was probably the furthest behind of the century riders (fortunately it was not a race). 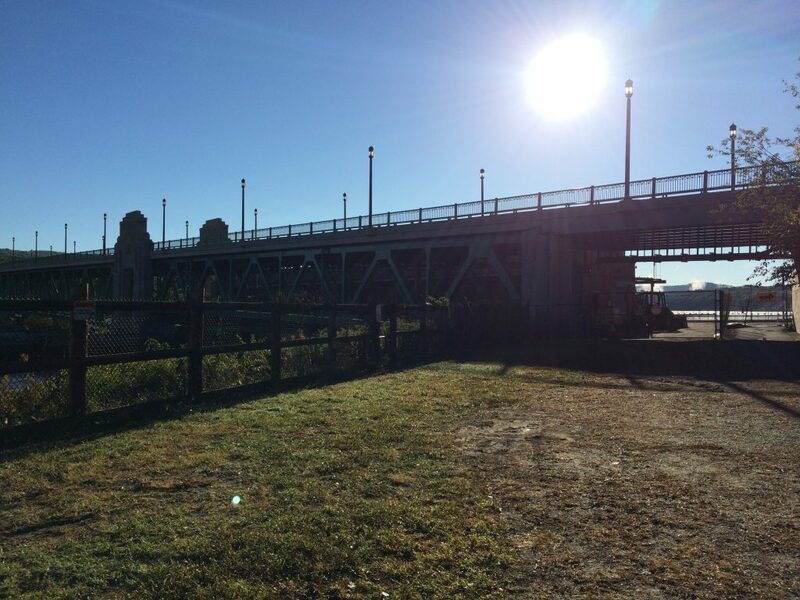 Once I got to the top of the hill, the road became paved, and then headed under I-91 into the town of Guilford. The ride started to head southwest at this point, then went south. This is where various hill climbing began to happen. A lot of it was gradual, but I was climbing much of the time. 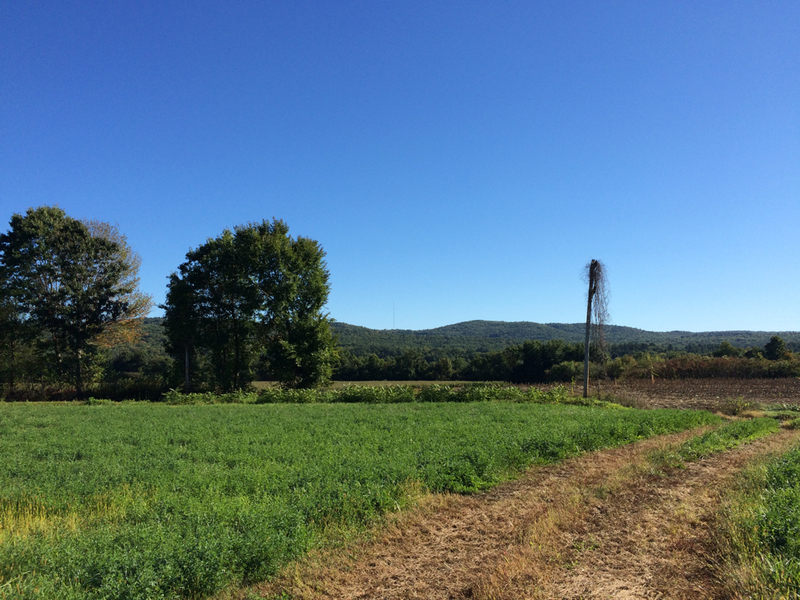 The route passed back into Massachusetts at mile 48, and then soon turned onto another dirt road. This one climbed a hill like the previous one, and on this hill I passed the halfway point of the ride. The dirt ended as I got into the Leyden town center. 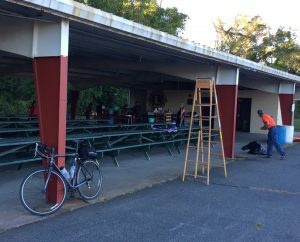 There was a cyclist at the Leyden town hall working on his bike, and a little while later, he caught up to me, and we rode together for a while. The route had a bit of downhill, but mostly more climbing as we went west into the town of Colrain, then headed south some more. This fellow cyclist was also on the 100-mile ride, and had gotten a flat on the second dirt road. He also said his wheel rim had gotten slightly bent. As we conversed, it turned out that we both work in different health care facilities in Holyoke, which use the same medical record software, so a bunch of discussion centered on that. He got a bit ahead of me as we went (most long-distance riders seem to be better hill climbers than me), but on a flat road I heard a loud “pop” from his bike, and we stopped. It turned out his tube had blown out. He didn’t have another spare tube, and I offered that he could try the one I had, but my tires were wider than his, so it wasn’t clear it would work. Before he made an attempt to use the tube, though, a support vehicle drove up, and the volunteers in it offered a couple of tubes, one of which seemed to be the correct size. Since he had other people looking out for him at that point, I continued on. Soon the last of the climbing was over, and I started heading downhill, out of Colrain into the town of Shelburne. 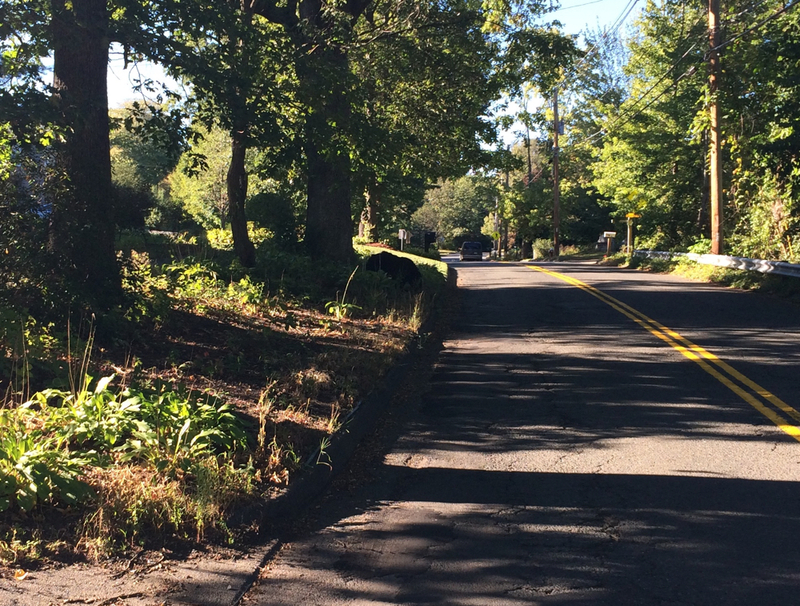 This was a long downhill section, covering 4 or 5 miles (and it allowed me to make up time after the slow climbing). Before 1:00 I was in Greenfield, riding on a short bike path. 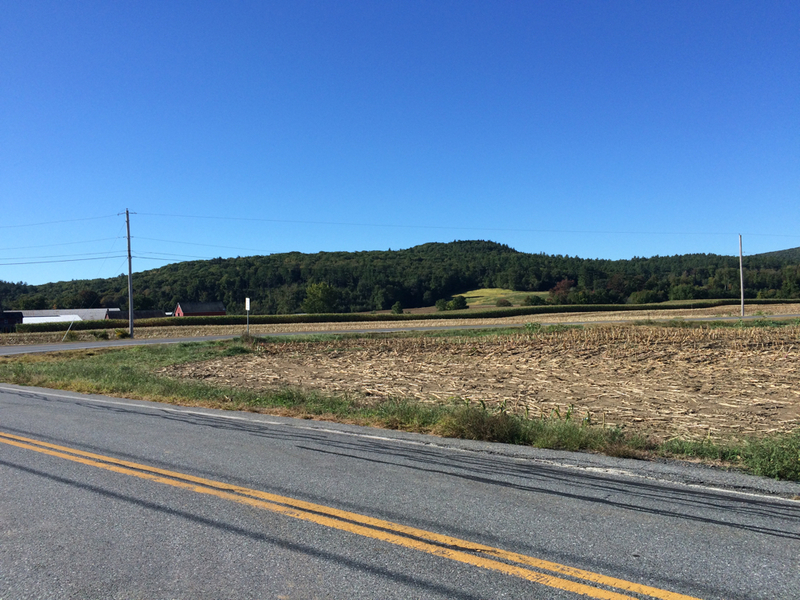 The riding was fairly flat there, and I ended up on routes 5 and 10 heading south into Deerfield. At this point I started to pass, and be passed by, riders on the 50-mile route. Their route coincided with the rest of the 100 from that point. 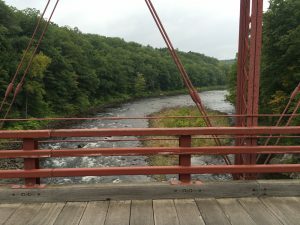 We passed through Historic Deerfield, followed the Deerfield river a bit, then went through Deerfield Center, before heading south into Whately. By the Whately town offices, I finally came upon a second water stop. 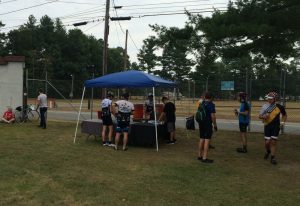 This one seemed to be staffed by a group of high school students, and they were offering chips and peanut butter sandwiches in addition to bars, water, and energy drinks. I took a sizable break here, which was at about the 74 mile mark. One thing that was odd at this stop was the lack of any Will Bike 4 Food signage, and in fact, once I got going again, I came upon another stop 2 miles later that did have such signage. I didn’t stop there since I just had done so. 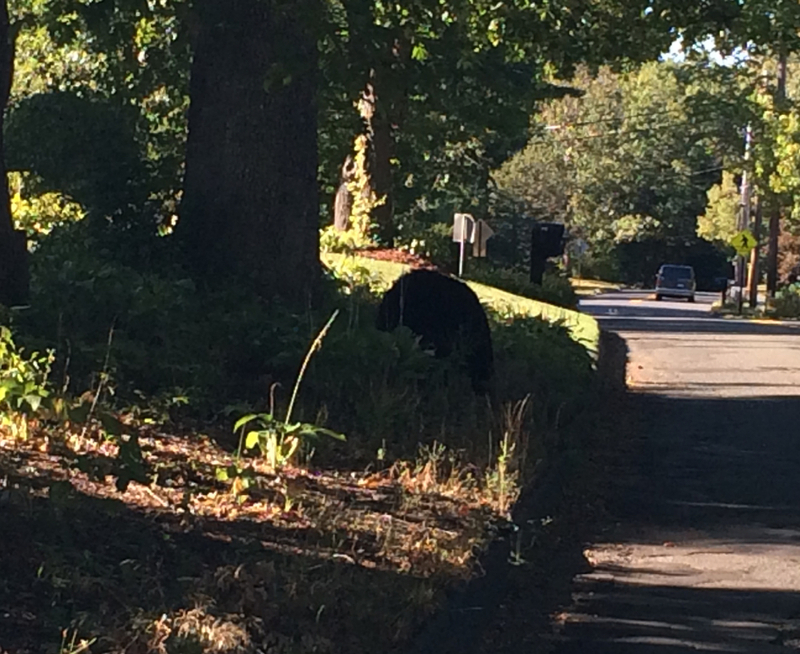 I really did not want to get closer to try and get better pictures, so you’ll have to trust me – that’s a bear. This was at mile 94, so I was in the home stretch. I rode northeast from there, back up into Hatfield, and eventually made my way back to the Lions’ pavilion. I got there and finished the ride at 4:45pm. I checked back in and had some dinner before they started to put away the food (the after-party ended at 5pm). 100.79 (couldn’t get my phone to focus on the odometer). Thanks again for those who donated – your support gave me some of the inspiration I needed to finish in record time. 9 hours and 45 minutes! The title says it all. I just finished the ride and checked in. Thanks everyone for your encouragement! I’m going to eat some food now. I’m in Williamsburg center now, nearly at mile 88. The whole ride is almost 101 miles, so I’ve got 13 miles to go (with not much climbing). Home stretch, here I come! It’s just after 2:00 and I’ve finally reached a second water stop. I’ve now gone 74 miles, and I’m feeling better than I was at this point in Bikefest last weekend. Time to tackle the last quarter of this ride! There was a bunch of climbing in the middle of the route, as I headed back into Mass, but I just finished a nice long downhill run. I’m at mile 61, in Shelburne, and soon I’ll be in Greenfield. I’m in Vernon, VT at the northernmost part of the route. I’ve gone about 42 miles. I was at the first water stop 15 minutes ago, but did not have great cell reception there. Now I begin heading back south. I’m in Turner’s Falls, having stopped for a bathroom break. I’m about to cross the bridge in the photo into Gill, where I’ll have the first real hill climb of the day. Distance so far: 19 miles. The sun is coming up and I’m about to head out on the ride. It’s chilly, but I’ve worn appropriate layers. More later as I progress. You did it! The total of donations made to my ride has exceeded the goal of $1000. As promised, I’ve made my $1000 contribution, bringing the total to more than $2000! This is the most I’ve ever raised for the Food Bank. Thanks to everyone who has donated for your support! Stay tuned on Sunday for the ride itself. 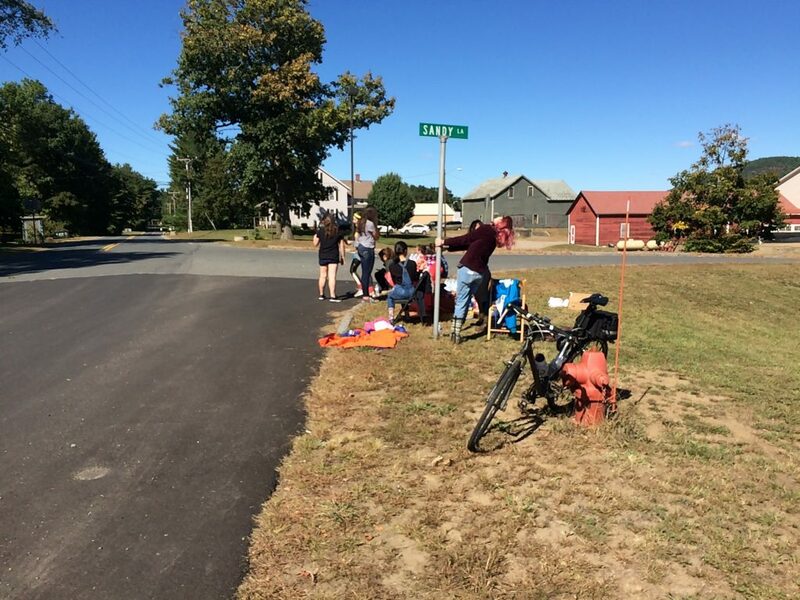 This past Sunday, the 18th, I rode in the Northampton Cycling Club’s BikeFest. It’s an annual event I’ve done multiple times before, and serves as a good final preparatory ride before Will Bike 4 Food. 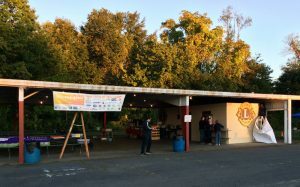 I rode the 75-mile route, which is listed in the main links on the page as a 72-mile route, for some reason (and they call it a “metric century”, which generally means riding 100 kilometers, or 63 miles). In any case, the route’s length was just over 75 miles, and we started riding just before 9am. The weather was very slightly rainy at the outset, but that cleared before too long, and I just had to deal with wet roads for much of the day. There was a fair amount of hill climbing in this route (a little more than 4600 feet worth), mostly contained in the first half of the route. Starting from Look Park in Northampton, we rode through the town of Williamsburg, then up into Ashfield, which involves a very long, gradual climb. Fortunately, it’s a climb I’ve done more than once in the past, so I knew what to expect. The long climbing was rewarded after Ashfield center with a whole bunch of downhill riding into Conway, then down into Buckland to Shelburne Falls. 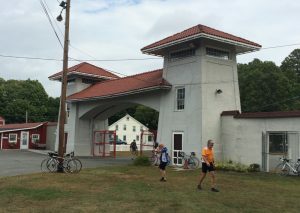 In Shelburne Falls, the ride had its first rest stop, at the 25-mile point. 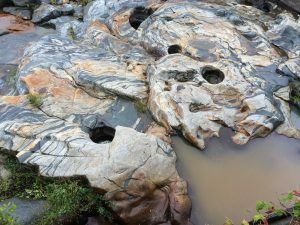 The stop was set up by the Deerfield River, and the geologic feature known as the Glacial Potholes. From there, the route actually doubled back for a few miles, heading south into Conway the way we’d come. 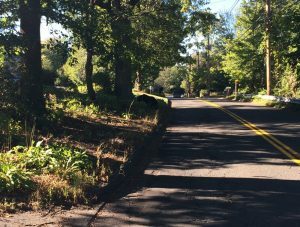 It then veered off east into territory I’d never been in – an area known as Bardwell’s Ferry. 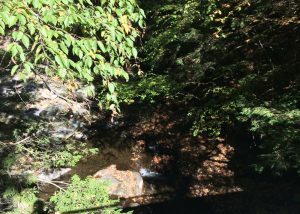 It’s a pretty area and I had to do some more hill climbing, then descended to a steel bridge that crossed the Deerfield. 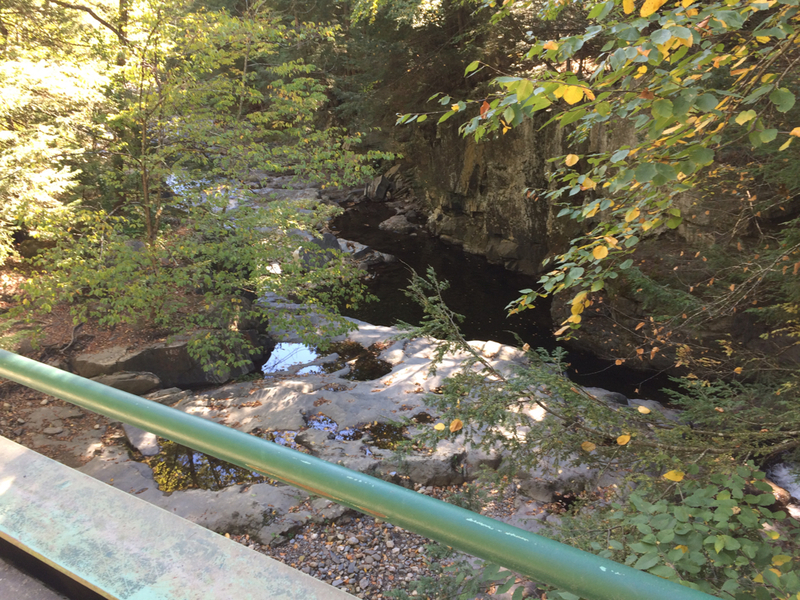 Here’s the view from the bridge, looking both up and downriver, followed by the bridge itself. The unfortunate part was that a steep, and somewhat long, climb happened immediately on the other side of the bridge. That climb happened to have a dirt and gravel section of road near the top, apparently because of construction (I don’t think it’s always a dirt road there). Through the Bardwell section, I passed, and was passed by, a number of riders doing the 50-mile route. We all had to rest at points going up this hill. There was some nice flat riding, and a little bit of downhill riding after the dirt bit, but soon another hill arrived, which I had climbed before. This was in the town of Shelburne, still headed east toward Greenfield. As I started up this next hill, I suddenly heard the sound of bagpipes. There was a large field of grass by the road, and up in the middle of the field was a piper, playing for the riders (I’d experienced the piping in a previous iteration of the ride, but only at a rest area, not in the middle of the countryside like this). I had to stop and rest before getting out of sight of the piper, so listened to the rest of the piece before continuing up the hill. Near the top there was another piper just on the edge of the road. Once that hill was crested, it was all downhill into Greenfield, so I got there pretty quickly, and arrived at the second rest stop. 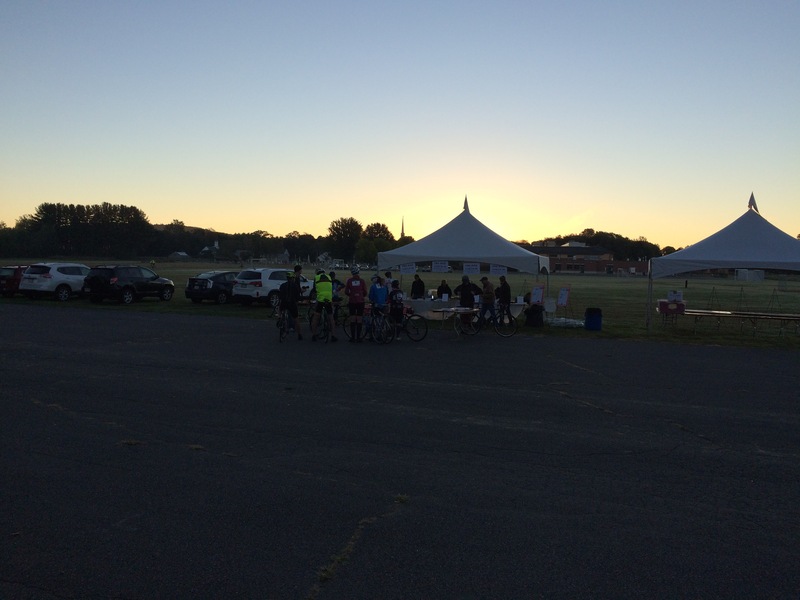 This one was at the Franklin County Fairgrounds, and at this point I was about 43 miles into the route. At this stop, we 75-milers mixed with people going 50 miles and some of those on the 100-mile trip. From this point on, I believe the 100-mile route lined up with the 75-mile (so the century riders were further along in their ride). From here the ride was less hilly. 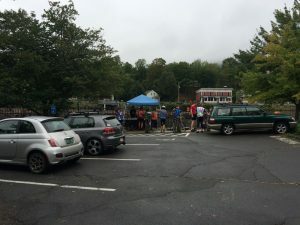 There was a bit of a hill climb in Greenfield before descending and crossing the Connecticut River into Montague, and then we rode the bike trail into Turner’s Falls, and had a moderate climb out of there to head south. I was beginning to get sore and tired by this time, so even though the terrain in Montague Center, and then Sunderland, was relatively level, I had to stop and rest a few times. The third rest area was in the center of Sunderland, at mile 60, and I believe I spent longer there than at either of the previous 2 stops (though still only about 15 minutes or so). The last 15 miles were almost completely flat, as I passed through Whately and Hatfield, then back into Northampton. I still had to stop a number of times, mostly to give my legs a rest for a few minutes each time. I still made good time, arriving back at the start 7 hours and 15 minutes after leaving. That timing certainly puts me on track for doing the upcoming 100-miles within my time goal. 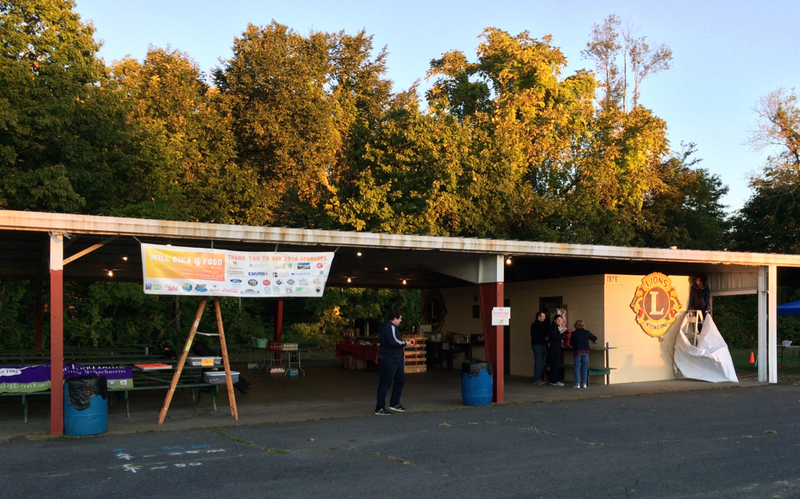 That century ride for Will Bike 4 Food is coming up in just a few days, and as I’ve done in the past, I plan to try and live blog the ride. Look for updates in this space throughout the day Sunday.